With more than 5 million people affected, more than 1000 killed, and with estimated total damages exceeding 4.5 billion Euros just in Europe and during the last decade, floods are among the most disruptive natural events threatening our Society. Due to increase in extreme weather events and rapid socio-economic developments in vulnerable locations, the risks connected to floods in general are growing rapidly, and the awareness of these risks and of the need to face them efficiently with an integrated approach is well testified in the “7th Environment Action Programme” of the European Commission. Strategies for adaptation and protection can range from reinforcing civil structures, such as dikes and drainage channels, to careful planning of land use and definition of apt evacuation plans; in any case, these strategies would strongly benefit from effective monitoring tools and early warning systems. 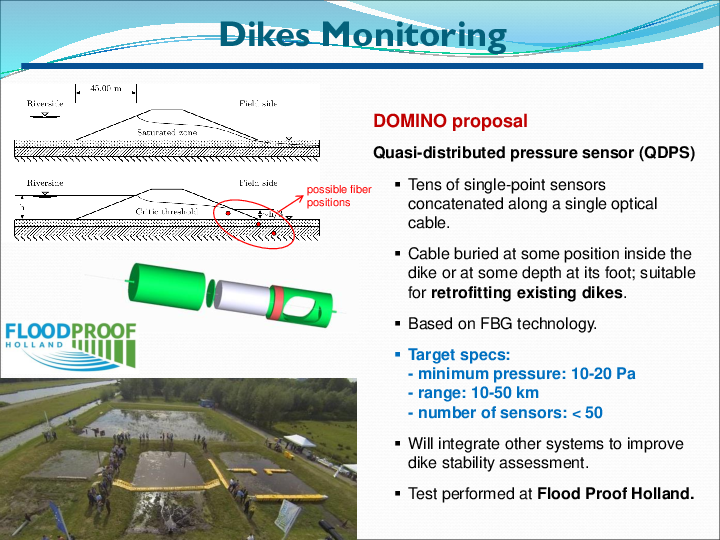 In this perspective, project DOMINO aims at developing novel fiber optic sensors (FOS) for the monitoring of dikes and debris flows, that could eventually be used to prevent disasters and manage the related emergency. 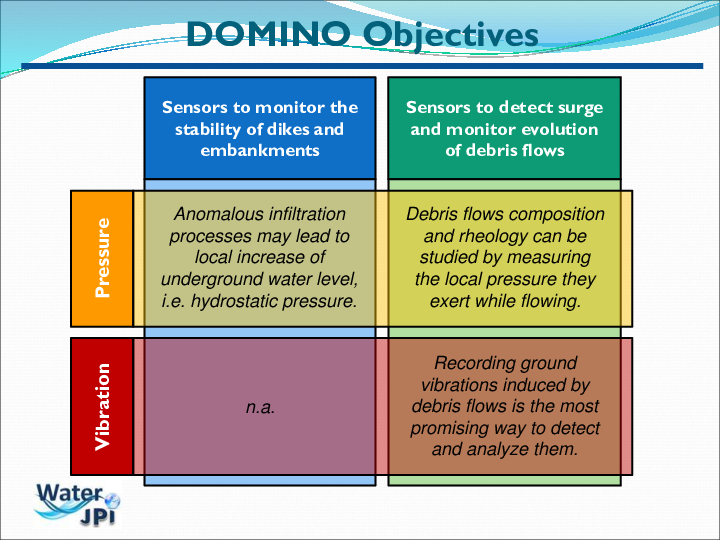 DOMINO will pursue this goal along two main research lines: the development of a distributed FOS for ground vibration measurement, to be employed in debris-flows monitoring, and the development of distributed and quasi-distributed FOSs for pressure measurement, to be employed mainly in the monitoring of dikes. 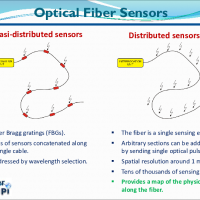 FOSs are experiencing ever increasing interest and diffusion as they offer several advantages over traditional sensors. Their small form factor allows to easily include them in the structures to be monitored, while the easiness of remote operation, together with their intrinsic robustness to extreme conditions, make them befitted to hostile environments. 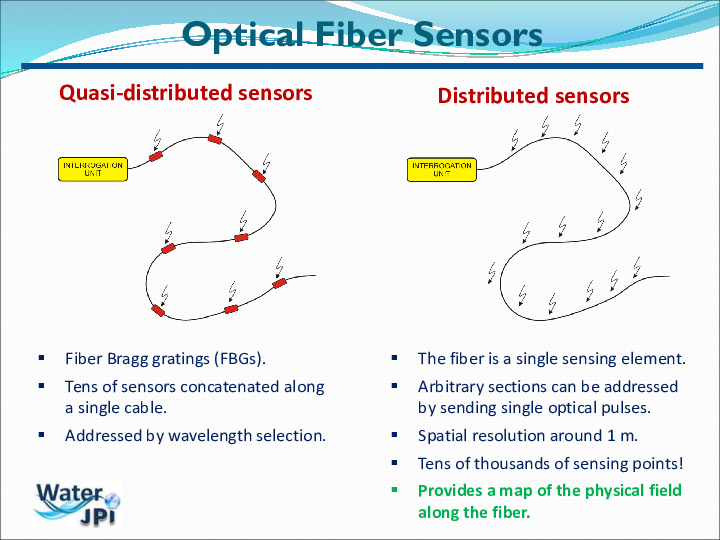 Most of all, however, FOSs can be easily concatenated and are the only technology enabling continuous distributed sensing, over distances of several kilometers. 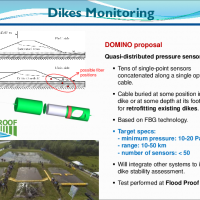 These very unique characteristics make FOSs the sensors of choice when large structures or sites have to be monitored, just like for dikes and for the channels and ravines along which debris flows may develop. To date, dikes stability is typically monitored by measuring parameters such as displacement, temperature and water pressure at specific positions. The use of FOSs has started recently, and it is mainly focused on the distributed measurement of temperature and deformations; nondistributed pressure FOSs are being investigated too. Results are encouraging, but the technology is not mature yet, in particular for what concerns pressure measurement. Differently, the monitoring of debris flows by means of FOS is still a largely unexplored field. Traditional monitoring is performed by means of geophones, inclinometers and trip wires. 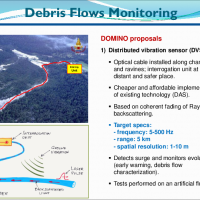 So far, the few reported examples of FOSs for debris-flow monitoring are mainly mimicking those devices, without exploiting the full potential of FOS technology. 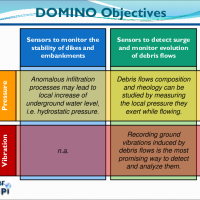 Project DOMINO will go beyond the state of the art by developing a novel distributed ground vibration sensor, tailored to the monitoring of debris flows, and novel distributed and quasi-distributed pressure sensors, to monitor dike stability and to investigate more in details the rheological and mechanical properties of debris flows. The complementary competences needed to succeed in this goal are well represented by the proponent Team, made of two units with experience in FOSs (University of Padova, Italy, and University of Alcala, Spain) and two units with experience in geohydrology (Delft University of Technology, The Netherlands, and Research Institute for Geo-Hydrological Protection, CNR, Italy). Moreover, the Team will constantly involve stakeholders and relevant authorities. 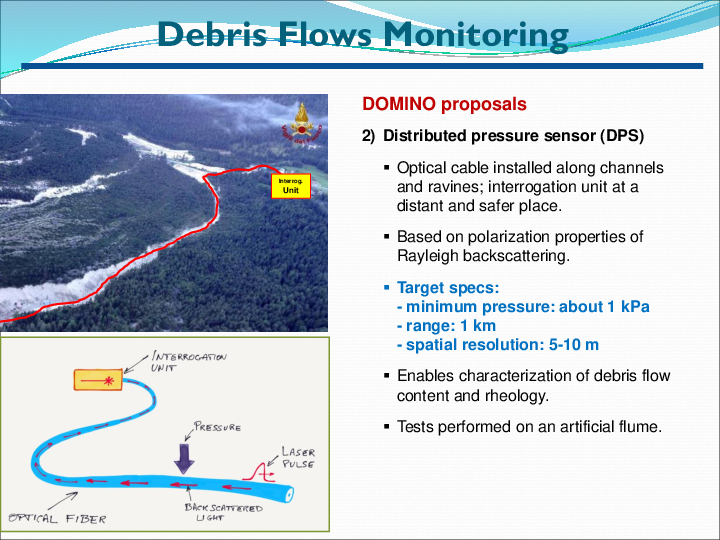 Eventually, DOMINO will not be limited to provide new tools for the monitoring and prevention of floods, but will also establish a new multi-disciplinary research group in Europe with specific expertise in dike and debris-flow monitoring. New and improved numerical models to increase knowledge about dike failure mechanisms and debris flow rheology. An engineered QDPS to improve monitoring of dike stability. 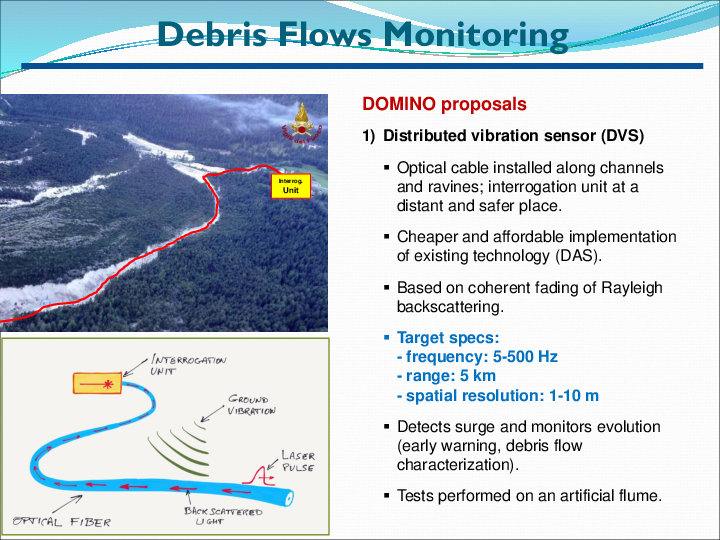 An affordable DVS specifically designed to address debris flows monitoring. 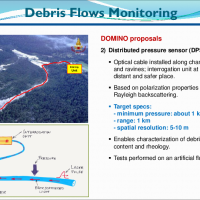 A DPS to characterize content and rheology of debris flows. Both pressure and vibration sensors may find application in other fields (most notably the oil and gas industry). Establishing a research group beyond the project duration. Contribute to the public awareness by pervasive dissemination actions and constant involvement of the relevant authorities.